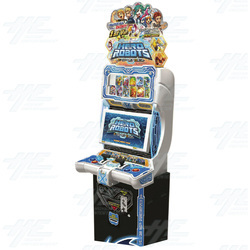 Hero of Robots Arcade Machine is a card collecting game where players battle giant robots. It is a turn based game, where players insert their collected cards to select robots and skills to fight. Each player takes a turn to select a 'move' from their collected cards. There are three different types of cards for players to collect: Robot cards (featuring a robot to use in battle), Power cards (to enhance the robots' abilities) and Skill cards (provides unique skills). Players use these cards to give attack or defense orders to robots. To win the game, players must choose the right attack or defense move to overpower the other. At the end of the 5 rounds, the winner is the player who has the most HP remaining. Players alternate between attack and defense each round, and the attack order is determined by who can pull the lever the fastest at he beginning of the game. During the game, the lever also allows players to increase the attack strength with their accumulated energy. The machine will dispense one game card to each player every time they play the game. There are three different types of cards for players to collect: Robot cards (featuring a robot to use in battle), Power cards (to enhance the robots' abilities) and Skill cards (provides unique skills). Players use these cards to give attack or defense orders to robots. To win the game, players must choose the right attack or defense move to overpower the other. At the end of the 5 rounds, the winner is the player who has the most HP remaining. Players alternate between attack and defense each round, and the attack order is determined by who can pull the lever the fastest at he beginning of the game. During the game, the lever also allows players to increase the attack strength with their accumulated energy. The machine will dispense one game card to each player every time they play the game.